Michael Pattison | idFilm: Gestures: "Christmas, Again"
Amidst a year-end spell engulfed in Oscars buzz and Star Wars hysteria, 'Christmas, Again' is a refreshingly gentle corrective to the triumphantly delusional schmaltz that saturates the holiday season box office. This text was first published by 'Keyframe' in December 2015. God gave names to all the workdays. Hashtags too. Black Friday. Cyber Monday. Giving Tuesday. Branding dates to help prime and prepare us as one calendar year hurtles out like an overloaded freight train, while another comes crashing in with calamitous indifference. Help, indeed: by now, the first weekend of advent, it’s virtually impossible to avoid the frighteningly cold reality that once again, quicker than could be foreseen, it is Christmas everywhere, everywhere, everywhere. So go the lyrics to Fran Alexandre’s 1958 single “Christmas Everywhere,” the curiously under-heard, enchantingly discordant festive ditty with which Charles Poekel concludes his winningly low-key debut feature Christmas, Again. For starters, stuff your sales, your charity and your philanthrocapitalism. The underlying refrain of this lo-fi production is that this isn’t commercial, consumerist clickbait. It’s unassuming, sensible, modest. The eponymous comma tells all. A frustrated groan, a longing glance. Remorse, nostalgia. It’s not quite a full stop: Poekel’s film hasn’t the aggression or the will to be all-out cynical about the most wonderful time of the year. But the jarring grammar of the film’s title lends pause even so. Punctuation is poetry, prophecy, pathos. 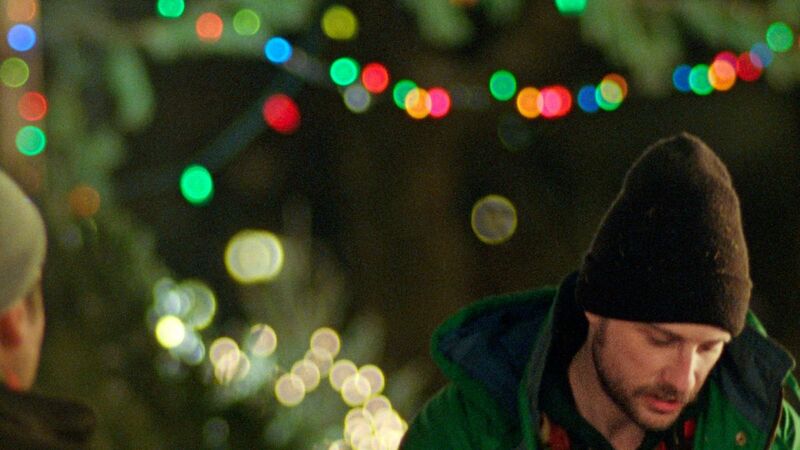 And for Poekel’s protagonist Noel (Kentucker Audley), yuletide this year is something to endure. All those seasonal festivities — all that cosiness and warmth, the cheer and the merriment — are for others to participate in. Not him: returning to New York City to take up his temporary night-shift duties manning a 24/7 stall selling Christmas trees, Noel is only reminded, everywhere he looks, of just how predictably lovely this time of year is meant to be. Trouble is, Noel is not merely cursed with a regrettably festive name: barely a moment goes by at work without his mind and heart drifting back to his recently aborted relationship with an ex-girlfriend. Customers enquire: “No Mary-Ann this year?” Noel doesn’t divulge anything, but we see that he’s hurting, bitter, distrusting. The present world mocks, conspires. Captured on 16mm by cinematographer Sean Price Williams, Noel is frequently framed against the soft-focus colours of tree-lights that decorate the area surrounding the roadside trailer he sleeps in. Occasionally, as if by accident, Williams pulls his focus so that our protagonist risks falling into a permanent blur, out of the picture altogether. Amidst a year-end spell engulfed in Oscars buzz and Star Wars hysteria, Christmas, Again is a refreshingly gentle corrective to the triumphantly delusional schmaltz that saturates the holiday season box office. Again, its weapon is a comma not an exclamation mark; think of it less as dreary downer than Noël naturalism. Drawing upon Poekel’s own time selling Christmas trees (customers here range from hearteningly appreciative to dispiritingly rude), the film dedicates its focus to the unexceptional, to the underdog, to the underappreciated, and emphasises mood over melodrama in doing so. Indeed, much of the film is about interior space, and the need to respect it. Physically, there’s Noel’s trailer, a place in which the line between an invitation and an intrusion — or the difference between, say, a romantic encounter and a sock to the jaw — is thinner than cheap wrapping paper. Christmas, Again is also about mental space. Noel spends much of the film wrapped up in his own thoughts, with Poekel preferring to imply rather than explain the character’s barely contained heartache. Suitably, Audley employs a range of minimalist gestures to nail his character’s quietly disarming, believably vulnerable nature. But this is Christmas (everywhere, everywhere, everywhere), a keenly aggressive reminder of failed romances and unwanted loneliness. And the one moment in which Noel’s otherwise contained torment boils to the surface — walking home in visible, painful tears — is prompted by time spent in the domestic space of a pregnant couple to whom he’s delivering a purchase. They’re not to know it, of course — and much less to blame — but the casually amorous attention they give to one another is understandably too much for Noel, sending him in nauseous retreat. Christmas, makes you sick.